the grass on the other side of the fence. It was during the early months of our marriage that the shocking truth became clear: My new husband zig-zagged. With the lawn mower, that is. Just weeks after our spring wedding, he dutifully set out to mow the lawn around the old New England house we’d just moved into. When he was finished, patches of unmowed grass and wildflowers remained throughout the yard. I was horrified. I come from a family of straight shooters, one that prides itself on a manicured lawn. I learned early on that cutting unwavering overlapping strips through an unruly lawn is therapeautic. My husband, on the other hand, scorned such perfectionism. He has a passion for color, variety – and nature. To him, mowing down bursts of dandelions, forget-me-nots, snowdrops, and other wildflowers was a crime. We were, it seemed, hopelessly at odds. I worried about our radically different approaches to mowing. Did a sloppy lawn suggest larger character flaws? Had I married the wrong man? I survived that first summer – hastily cutting down the offensive tufts just before company arrived. Then, on our first wedding anniversary, I found a note slipped under the door of my home office while I was working. “Step out on the balcony for a surprise,” it said. When I did, I looked down on a huge yellow heart – a mass of buttercups in full bloom – carved out by my husband’s mowing artistry from an otherwise neatly cropped lawn. That was the beginning of my conversion – or at least my softening. No longer am I a strictly geometric mower. I’ve even been known to leave behind flower-filled tufts. And my husband has proven he can mow a pretty mean straight line – if important company is coming. We’ve managed to resolve our turf wars and remain happily married. But for many people, it turns out, the battle is in full swing. Arguments in favor of lush lawns are being met with rebuttals in defense of carefree meadows. Not long ago on “The Connection,” a popular Boston radio show, people from Cape Cod to Iowa called in to defend their turf. You can’t play baseball in a meadow, argued the lawn enthusiasts. You can’t barbeque, run through the sprinkler, or squiggle your toes. Nor can you inspire the admiration – and envy – of your neighbors. But, countered the meadow champions, why waste time and money battling your way to an unnatural weed-free green carpet, when you could encourage wildlife, create something naturally beautiful, and do your part to curb the use of water and pesticides that go into lawn care? It wasn’t always this way. For more than a century, there has been little debate. America has been completely in love with lawns. It began in the 1880s, with the arrival of the lawn mower. Unlike the sheep they gradually replaced, the new fangled cutting machines mowed down just about everything. Lawn lovers could now lavish fastidious attention on their plots. Lawn enthusiasts could choose from a menu of chemical enhancements that could contol weeds, kill insects, and create a greener lawn. American homeowners had access to newly manufactured chemicals – thanks to the war. Seed choices have also multiplied. In 1954 there were still just two Kentucky bluegrass varieties on the market. Today there are more than 100. The one perennial ryegrass available in 1960 now comes in an astonishing array of nearly 300. During the postwar years, as surburbia spread across the country and emerald golf courses became the standard to which everyone aspired, the pursuit of the perfect lawn became, as the title of Jenkins’ book suggests, an obsession. For many it continues. At Susan Perren’s house just outside Washington, D.C., nobody is allowed to touch the lawn – except her. Not her husband. Not even her son, who runs a business maintaining other people’s lawns. Perren is a woman with a passion for grass. She mows her suburban quarter acre four or five times each week, varying the pattern each time. She waters deeply every few days. And she has devised a meticulous annual maintenance schedule. In February she puts down weed killer to get a jump start on the crabgrass. In April she fertilizes. Several times a year she scatters compost with a bowl, works it into the soil, then waters it down. Perren epitomizes the American love affair with lawns. She is not alone. 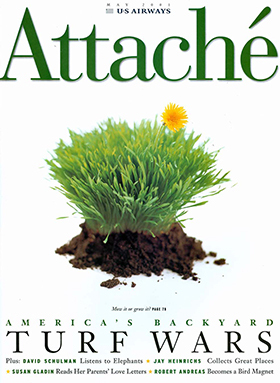 The spring 2000 issue of Scotts Lawn Care magazine – offering “Helpful do-it-yourself information since 1928″ – features testimonials from lawn devotees. “Thanks, Scotts. You’ve made my lawn the talk of the neighborhood,” writes Paul Altamura from East Windsor, New Jersey. Next to his quote is a snapshot of his perfect lawn. “We never tire of the compliments and people telling us we have the most beautiful lawn on the block,” write Nola and Bob Laughery from Connelsville, Pennsylvania. In their effort to keep the country’s suburban carpet thick and green and well trimmed, lawn enthusiasts tackle their turf with a dizzying array of gear. Sears, the nation’s largest supplier of lawn equipment, offers more than 600 items, from catch bags and mulch kits to aerators and dethatchers, from sweeper attachments and vacuums, to rollers and sprayers – the list goes on. According to the Environmental Protectoin Agency, Americans also pour 70 million pounds of chemicals on their lawns each year. And hundreds of thousands of gallons of water. A 1,000-square foot lawn, for example, demands 600 gallons of water each week to keep it green. These are the statistics that make the anti-lawn crowd cringe. They are convinced there’s another way. Keep your lawn, but lose the chemicals. That’s the philosophy at Gardens Alive!, a mail- order company catering to homeowners who can’t bear to give up their lawns, but want a more natural approach. “Our customers are hearing about the dangers of traditional lawn care and wanting to do it the environmentally correct way,” says Walter Logan, director of marketing for Gardens Alive! The company’s all-nautral answer to traditional “weed-and-feed” inorganic products is Wow Plus, a mixure of corn gluten meal and animal and plant byproduct fertilizers designed to control emerging weeds and feed the soil, not just the plant itself. Traditional turf enthusiasts disagree that chemicals themselves are a problem. “There’s an awful lot of lawn bashing going on these days,” says John McPhail of Gold Star Turf Farm in Canterbury, New Hampshire. McPhail likes to tick off the environmental values of the lawn, including the fact that 2500 square feet of lawn produces enough oxygen for a family of four. He also emphasizes that the real problem is not with the chemicals themselves, but with their application – specifically with homeowners who operate on the principle that if some is good, more must be better. Whichever side of the chemical issue you’re on, everyone agrees on one thing: mow high. “We tell our students, ‘The higher the shoot, the deeper the root,’” says Pat Vittum, an entomologist at University of Massachusetts. Vittum explains that most lawn problems come from dropping the mowing height, which stresses roots and creates damage. “We seem to have this need to beat our lawns into submission by mowing once a week, but that really shocks it.” Keep it up, says Vittum and your lawn will be dead by the end of the summer. The simplest solution to all this agonizing about lawn upkeep, of course, is to go the meadow route. And more and more people are doing just that. Diboll estimates that the planting of prairie on private land has increased more than ten times in the past fifteen years. “And the demand for prairie plants and seeds has never been stronger,” he says. So while it seems certain that meadows will continue to crop up across the country, it also seems unlikely that Americans will ever give up their lawns completely. Who can explain what it is that draws us to our green spaces? Clearly there’s a satisfaction, a meditative quality in the simple act of mowing that nothing else quite matches. My friend John Tibbetts is particularly attached to an old electric mower he inherited. His favorite time to mow? After dark. He plugs in his machine, adjusts the miner’s headlamp his wife gave him for his birthday one year, and off he goes, silently communing with his lawn beneath the night sky. We all have our lawn anecdotes, our favorite childhood memories, our stories. And, as the years go on, we will undoubtedly develop stories of our meadows – of butterflies and birds looping among the flowers, of breezes bending through the long, unmowed grasses. And more and more of us, it seems, will show off lawns filled with clover and other natural plants, maintained only by mowing, composting, and judicious watering. So, no matter how you mow it – five times a week or once a year, one thing seems clear: Americans remain passionate about their personal plots. Short or long, weed free or flower-filled, in the midst of a changing lawn ethic, our love of the land remains. It is, you might say, our common ground.